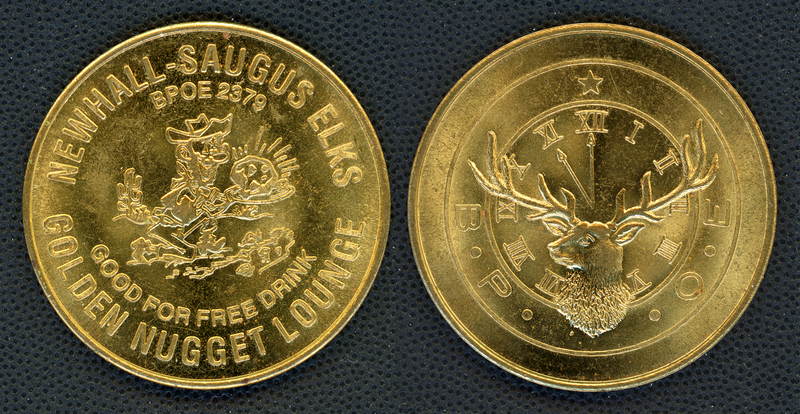 SCVHistory.com LW2940 | Organizations | Good-For Token, Newhall-Saugus (Santa Clarita) Elks Lodge 2379. Brass token, 1½ inches, n.d. Good for one free drink at the Golden Nugget Lounge, Newhall-Saugus Elks Lodge, B.P.O.E. 2379. Depicts a cartoon prospector holding a large gold nugget with a cactus (saguaro?) in the background. LW2940: 9600 dpi jpeg from original token purchased 2017 by Leon Worden.